If you own a deck -- especially one in a shady or wet location -- you have to accept that mold is part of the ecosystem. It will grow whether you use redwood, cedar or pressure-treated decking, and whether or not you paint the wood. If you want to control mold and mildew, you have to clean the deck periodically. The best thing to use isn't chlorine bleach, but plain water and perhaps some detergent. More than a million species of fungus inhabit our planet, and mold is a term that refers to some of them. Fungi need moisture to grow, and decking boards that don't get enough sunlight to dry out provide plenty of it, along with the cellulose on which some of the more dangerous species, such as Stachybotrys chartarum, feed. This greenish-black mold not only looks bad, it makes the deck slippery and unsafe, and the spores that it releases can cause respiratory illness and allergic reactions. Moreover, black mold is usually accompanied by wood-eating fungi, which cause rot that deteriorates your deck. While chlorine bleach kills surface mold, there are reasons to avoid it in most cases, not the least of which is that it's bad for the environment and is toxic to plants. Bleach has a high surface tension that prevents it from seeping into the wood and killing the embedded mold roots. Pressurized steam is the best way to treat deck mold, but in the absence of steam, a good scrubbing with a simple cleaning solution is effective for most situations. Using a pressure washer is an optional step that can speed cleaning and rinsing and help brighten the wood prior to refinishing a deck. You rarely need more than 1,500 psi of pressure to clean a deck, and virtually any pressure washer -- even a light-duty electric one -- can deliver this. A 40- or 60-degree nozzle and a pressure of 800 to 1,000 psi are standard for general deck cleaning. You can easily damage the wood by using too much pressure or too narrow a nozzle or by holding the nozzle too close to the deck surface. 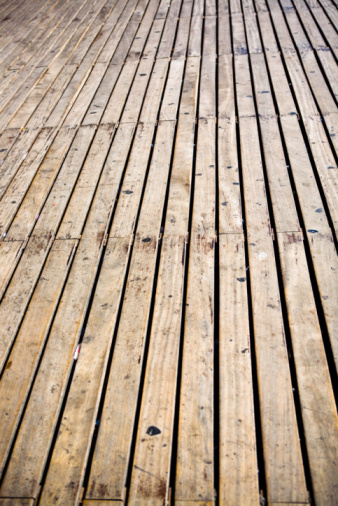 Clean the decking boards systematically, starting on an inside corner of the deck and working your way out. Use the same systematic approach when scrubbing with a soap solution. Rinse thoroughly with a garden hose after scrubbing to remove all the soap, which could make the deck slippery. To clean mold from a finish that you don't want to damage, the best tools are a bucket containing a mixture of 1/3 cup laundry detergent per gallon of water, and a scrub brush. If the mold has stained the wood, a deck cleaner containing oxygen bleach can help to remove the stains. Another option is white vinegar. A mix of one part water to one part vinegar can serve as an anti-mildew spray. Use a spray bottle to soak the deck. Baking soda is an option as well; just be careful not to mix with vinegar unless you want a school science fair project on your back deck. A broom or a brush with stiff bristles is your best bet for spreading and scrubbing. Mix one cup of baking soda with one gallon of warm water and scrub away. Rinse down with a garden hose when done. If you use a deck cleaner with oxygen bleach, it may be best to follow with a compatible deck brightener solution. The acid in brighteners help balance the high pH of oxygen bleach cleaners, making the wood more stable for finishing. Frequently sweeping your deck is one of the best ways to prevent mold growth. It disperses leaves and other debris the mold can grow under, and it prevents spores that have landed on the deck from rooting. It's also essential to keep the wood dry. That may be difficult on the parts of the deck in perpetual shadow, but you can at least keep your gutters in good repair to prevent runoff. When you sweep the deck, use a putty knife to clear debris from between the boards; this improves drainage and helps keep the sides and undersides of the decking boards dry.